White win draw fort: Any draw fort that has contact with the board edge and a mobile king contained in its structure, the king having contact with the board edge. i.e. white has built a safe, defended escape route from the board, which would still be impenetrable with the king having escaped. Or more elegantly: If the king has contact with the board edge, is able to move, and it is impossible for black to capture him, white wins the game. Just had an interesting test game against Oddur. White managed to build the edge fort - but it was not possible to create space for the classic fort with 4 edge squares. Only 3 edge squares were vacant, just what's required for the type of fort, Adam suggested. I meet opponents who suspect that it's now too easy for white - a good question! Earlier white against a strong opponent often faced either a quick win or a quick death; the only emergency exit in practice being the rare perpetual check or the now (supposedly) canceled center fort option. There've certainly been cases where my whites could use some extra help for a second chance. But hopefully some serious test games can judge on that. In my opinion the edge fort however is for advanced players. Very difficult. The details can seem a bit academic, as the test games so far still suggest that the edge fort end game is rare. Hagbard wrote: In my opinion the edge fort however is for advanced players. Very difficult. The details can seem a bit academic, as the test games so far still suggest that the edge fort end game is rare. I quite agree Hagbard. Though the devil is often in the details. It may well be that the ultimate rule set will favour one side for new players (Fetlar already seams much easier playing white for new players). However, our quest for balance should result in a game that balances for experienced, even expert players. 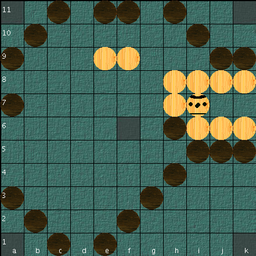 New players can handicap the king as they wish while learning black strategy. As you say, the test games should give us some idea. This post maybe fits better in 'quest for balance', though this post is really a subset of that. Adam wrote: Though the devil is often in the details. Exactly. And if perpetual check gets the chop, then we would need a third rule explaining stalemate possibilities. 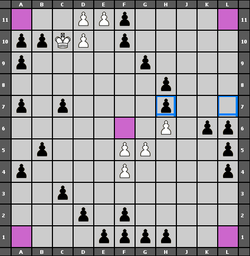 Edge forts with an immobile, uncaptureable king being the only stalemate position allowed, and perpetual check disallowed, forcing the checking player to make an alternative move in place of a third repetition. We also thought the best way of testing this would be to hold a copenhagen rules test tournament, being that the rule adjustments came about as a direct result of experienced players competing in tournament situations. No reprogramming necessary as long as the players are all agreed when they sign in to abide by the copenhagen rule set, and resign accordingly should the need arise. I suggest we do this on Aage's live hnefatafl site, and aim for a total of 8 players, with a cutoff date for entry, at which point we play out the games with how ever many players we have. Adam wrote: We also thought the best way of testing this would be to hold a copenhagen rules test tournament, being that the rule adjustments came about as a direct result of experienced players competing in tournament situations. No reprogramming necessary as long as the players are all agreed when they sign in to abide by the copenhagen rule set, and resign accordingly should the need arise. I suggest we do this on Aage's live hnefatafl site, and aim for a total of 8 players, with a cutoff date for entry, at which point we play out the games with how ever many players we have. How about one month to sign up? So that by April 1st we continue the tournament with how ever many players we have? Hopefully a tournament completion cutoff date won't be necessary, but I think it'll last at least a month, till May 1st. There'll be a new button, "Tournament Copenhagen Hnefatafl 11x11", and we simply use this button with our normal aliases. The way to sign up is simply to do an invitation with the tournament button. To speed things up, the first games can begin immediately when the button is ready. 3b. If no offensive player can be determined (due to mutual symmetric threats, or that no direct threats are made), the game is a draw at the forth repetition. Adam wrote: And with the addition that any repeat move that involves a checking move may not be repeated more than 3 times, at which point the checking player must make a different move. Might as well tidy up this lose end while we are at it, even if in the stats this kind of draw is rare. Its created schisms on other sites, and I've dealt these draws out and been on the receiving end, and neither is very satisfactory. Neither player feels like they've done a good enough job, hence the draw. But as the onus is on white, it should really be disallowed. But then again, wouldn't a situation like the following example be extremely difficult to do in chess? 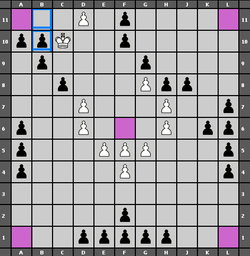 The situation in diagram 1 occurred after only 26 moves (13 black and 13 white moves). After 47 moves, the corner situation in diagram 2 is still unchanged. So it's obviously possible for white to keep the perpetual check on hand and black cannot do a thing, while the game continues at any length on rest of the board. White can do this because he's assured the draw, and at the same time he can wait to put it in effect until any future point in the game. A situation like this can only be avoided if it does [i:21ah96xh]not[/i:21ah96xh] assure white a draw, i.e. it must instead be a loosing position for white, white's perpetual check must be turned into white loss. If this type of perpetual checks were to be abandoned, the same should go for other perpetual checks, for rules to be consistent. Conanlibrarian mentions a case where black does the perpetual check, and cases of perpetual moves trying to capture an enemy piece. When black is responsible for the perpetual moves, of course white is not to punish for it. In all these cases, one of the parties ("the attacking party") is trying to accomplish something which turns out not to be possible, because the opponent is able to prevent it. So the "attacker" must accept that his attack cannot succeed and must stop his perpetual moves. - It makes sense for the "real battle" behind the game. The king is running towards the exit; an enemy warrior is jumping back and forth blocking the way, so the king does not escape. If the king's aim is not only the negative one not-to-be-captured, but above all to escape, that situation is a defeat for him. If just one enemy warrior can effectively stop the king at a corner, this could also lead to interesting new black corner tactics. The classic board game idea of the players moving alternately is normally a close enough simulation of overall movements on the battle field. But when two pieces start their perpetual step dance this simulation breaks down: the whole board except the two step dancers freezes like a broken film. In "real battle" everybody else would not freeze just because two men step dance, but movements would continue on rest of the field. If a series of moves is repeated three times, both players may do the repetitive move plus an additional move with a piece other than the repetitive one. Starting with the defensive player (i.e. the one receiving a threat), and until the repetitive moves stop. Hagbard wrote: when two pieces start their perpetual step dance this simulation breaks down: the whole board except the two step dancers freezes like a broken film. In "real battle" everybody else would not freeze just because two men step dance, but movements would continue on rest of the field. A lovely description of why perpetual check is unsatisfying in that it destroys the model of reality being played out on the board. And a lovely suggestion for a solution. The onus is on the aggressor, they can choose to repeat a third time, at which point the extra move comes into play. Interesting idea. Worth a try. Is the copenhagen tournament being played allowing perpetual check? The idea being we test just the edge fort and surrounding rules? Also, how are we tackling the stalemate fort (edge fort with immobilised or garbo'ed king)? Hi, after 6 month I am back on aagenielsen and I was suprised on the rules you are playing know. I hate draw forts, because I learned 20 years ago, the king have to escape otherwise he is starving to death during the rampart. But draw forts are an interesting turnarround of the game. Giving white a secound chance. The kopenhagen rule are nice but in my opinion not easy enough. I think the hagbard rules are perfect to discribe what the kopenhagen rule are used to be. But I dont think it is nessesary to force the king to leave the throne - If he is captured on the throne or white is not movable anymore, white lose the game. Why we need a rule that the king have to leave the throne in time? Adam wrote: Is the copenhagen tournament being played allowing perpetual check? The idea being we test just the edge fort and surrounding rules? Also, how are we tackling the stalemate fort (edge fort with immobilised or garbo'ed king)? Rule+3) If a series of moves is repeated three times, the offensive player (i.e. the one performing a threat) must find an alternative move. If no offensive player can be determined, the game is a draw. to the tournament? There has been no need for it yet, but I'm sure there will be. The additional-move board defrosting idea is terrible programming and cannot be implemented now. The Garbo fort and draw draw forts are different in nature from perpetual checks. There's no board freeze, all pieces move normally, it's just that white is out of reach of any attack. I suppose that these situations must remain a draw? - They could be white losses, but as draws there's still something to fight about. Ok, I'd like to chuck some thoughts in here. I wouldn't object to this rule being added as it stands, though it's possible some player might object , but since the situation of draw-by-repetition hasn't yet come up, it shouldn't be an issue, especially since you've stated this is a test tournament. The only problem I can think of is if the two players don't agree which one of them is the "offensive" player. I suppose in that case they would have to agree on a draw anyway, but then we're back where we started with draw-by-repetition. In cases where check is involved, the offensive player is easy to identify, so possibly this rule should apply to perpetual check only. That still leaves us with the possibility of draw-by-repetition where check is not involved, but if check is not involved, neither player is compelled as strongly to repeat the moves, and each one can make his own value judgement of whether they offer or accept a draw, or make an alternative move. This sounds reasonable to me, so far. Other tafl-forms such as Rachunek already have this feature, in fact, it's stronger isn't it? Don't the rachunek rules say that white instantly loses if they perform three identical checking moves in a row? Imagine bunging that into Copenhagen - you could probably even program it. Third check in a row - Kaboom! Game over. I put "either player" though of course this really only applies to white, unless very exceptional circumstances arise, which I can just barely imagine. So, what do you think of this idea? As for the attractively-named "draw draw forts" (is there an echo in here?) we don't need to list every kind of fort, it is sufficient to define the only type of draw-fort that is a win for white, e.g. king is on an edge square, with the ability still to move, within an unassailable structure. All other forts are draws, except enclosable centre forts of course which under the copenhagen rules will eventually result in a loss.